It’s a proven way to get in on a closed-end fund (CEF) before its next huge surge: watch for the managers to buy shares of the fund with their own cash—then dive in right alongside them. I’m telling you this now because one of the smartest minds on Wall Street just dumped a pile of his own money—$2.6 million, to be precise—into one of the funds he personally manages. Such a brazen move by an insider is one of my favorite buy signals. Today I’m going to reveal both the investor and the 7.1%-yielding fund he just snapped up. Of course, we’ll also cover the many reasons why you should seriously consider copying his canny move now. I’m talking about billionaire Mario Gabelli, who has been managing money for investors since founding his own firm, GAMCO Investors, in 1976. 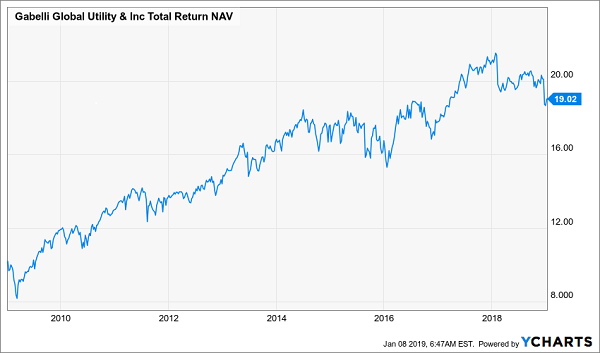 In investing, as in everything else, it pays to study the masters, and Gabelli has done just that, using a Warren Buffett–style value-investing approach to regularly beat the market. But he does part ways with Buffett in one key area: dividends. Unlike Buffett, whose Berkshire Hathaway (BRK.A) holding company doesn’t pay dividends, Gabelli has returned billions to investors through the outsized payouts on the funds he manages. The kicker is that Gabelli’s tendency to put his own cash into his funds is great for investors like you and me because it ties his interests directly to ours. And of course, the fact that his stock picking has made him personally very rich is another reason to keep him on your radar. Gabelli obviously knows when something is absurdly cheap—especially when it’s his own fund! That’s undoubtedly why he bought over $2.6 million worth of shares in the Gabelli Global Utility and Income Trust (GLU). GLU can be considered a sleeper fund. With just $326 million of assets, it quietly ticks along while most people obsess over big-name ETFs like the Utilities Select Sector SPDR (XLU), which has a whopping $8.4 billion in assets. So what’s so good about GLU, and why is Gabelli buying it now? 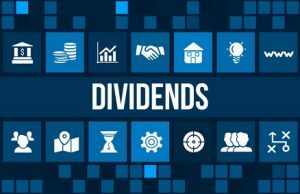 Let’s start with that huge 7.1% dividend, which has been rock-solid, holding fast since 2011, while many other high-yielding stocks and CEFs have cut their payouts. That’s because GLU holds a bevy of utilities that Gabelli picked up at great prices. In turn, these companies have been steadily hiking their own dividends. But the real beauty of GLU is that, unlike the passive XLU, it isn’t locked into utilities. 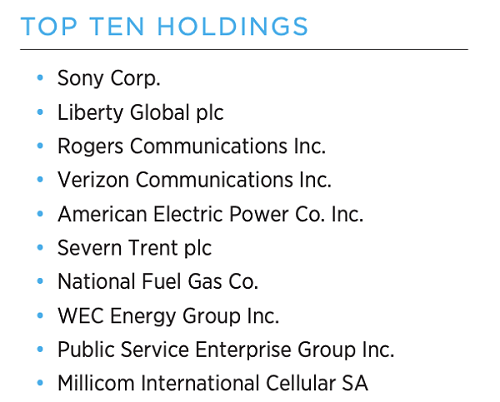 This lets Gabelli go to work in other areas, like telecoms and other proven dividend growers, giving us some nice diversification that helps steady the fund and keep its high income stream safe. Here’s where our chance to buy comes in, because lately this panicked market hasn’t been rewarding GLU’s long-term record of delivering income to shareholders. With a few exceptions lasting a few months each, GLU has seen its portfolio steadily rise in the long run. Sure, there was a big dip in 2018, but that was an anomaly. With a decline in its portfolio lasting nearly a full year, this recent weakness has exceeded the five-month dip in 2017 and even the eight-month dip in 2015. This is a clear sign that GLU is oversold and a turnaround is just around the corner. 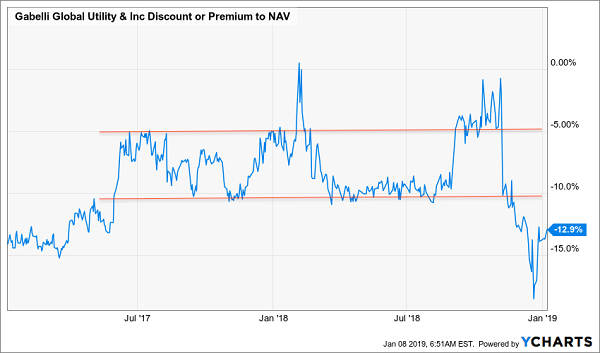 There’s another reason GLU’s rebound is at hand: the gap between the fund’s NAV and market price. In mid-2017, GLU established a clear range for its discount to NAV of between 5% and 10%. As you can see above, it hasn’t just dipped below that range in recent months—it’s torn a hole through it. Why? Because of a technical factor called the standard deviation of GLU’s returns. We don’t have to get into the weeds here; simply put, when the standard deviation is on an uptrend, the fund has recently suffered a big downturn and is about to recover. In other words, it’s a pretty clear indicator that a fund has gone from overbought to oversold. 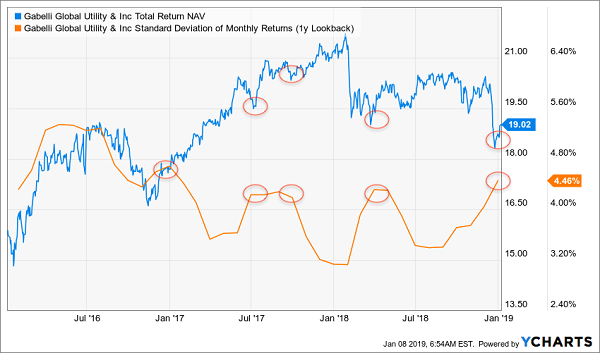 In the chart above, you can clearly see that each red circle on the orange line (standard deviation of returns) is at the same point as the red circles on the blue line (total NAV returns). What’s more, since early 2017, this indicator has consistently predicted a short-term jump in GLU’s price return—and it’s lately been at its highest point since January 2017, right before the fund rose 20% in a little over a year. But you can expect even bigger returns in the near term, which is why it’s no surprise that Gabelli has sunk over $2 million of his own cash into this fund. With the trend now established for two years, investors are even more likely to realize the mistake they’ve made with GLU and bid it up sharply. Finally, there’s one more reason to put GLU on your buy list: the US dollar has soared against foreign currencies over the last year because of the Federal Reserve’s interest-rate hikes, which have gone too far, too fast. Fed Chair Jerome Powell has admitted as much, telling the markets that interest rate hikes in 2019 will be slow, if there are any at all. That, in turn, will weaken the dollar, boosting GLU’s foreign-income stream. When investors figure that out, expect them to jump in and grab this fund’s safe 7.1% yield.